The willingness and capacity of an individual to develop, organize and manage a business venture alongside the risks involved in order to make a profit, is what we refer to as entrepreneurship. 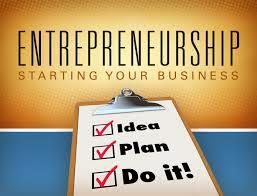 A common and simple example of entrepreneurship is the starting of a new business. In the world of economics, it is one of the units of production and when combined with capital, labour, land and natural resources it yields a profit. The global market is very dynamic and challenging as it keeps on changing with time (Lehman, 2011). To make matters worse, it is increasingly competitive thus an entrepreneur should be innovative and a risk-taker so as to navigate through it. A business venture is an entity developed by an individual or a group of persons with the intent of making financial gains. The creation of a business enterprise is brought about by high demand and low supply for a product or service. Consumer needs are identified, and the entrepreneur develops the idea, markets it and eventually sells the product or service he/she has developed. It may be very simple to define what entrepreneurship is but to execute it is much more of a task. Entrepreneurship in not just about coming up with an idea, this is just the tip of the iceberg. An entrepreneur should come up with practical and affordable ways to reach interested customers (Elfring, 2005), and this is where the issue of a business model comes about. In this report, my focus is solely on how a business model works and its importance in making a business venture valuable. A business model describes all the means and methods that a company employs so as to earn revenues as projected in its plans. According to it, a business is a system with many processes within it, and all of them must work at par with each other so as to realize a profit in the end. A good business model provides a business venture with ways to survive and grow in the ever competitive market (Haslam, 2015). A business model contains many untested assumptions, and as the model is implemented, the assumptions are tested and refined, that is why it is referred to as a work in progress. A business model is just but a hypothesis that gets applied as the business sees the light of day. It shows the viability of a business venture and everything that should be done to make it profitable. A business model is just like a new story and it takes on a life of its own. It contains a long and detailed information coupled with large amounts of financial predictions that are all based on assumptions rather than knowledge (Osterwalder, 2010). The ratio of assumptions to knowledge is very crucial and should be well balanced so as to make the business model practical and real. Business models are developed to elaborate how enterprises work. They addresses the following key issues in a business such as who a customer is and what they value, how a business makes money and the underlying logic that explains how a business can deliver value to its customers at a cost that is appropriate. A business model reminds the stakeholders and employees of a company about their goals and future plans in making their business profitable. This being so, it should be documented so that it can be easier to refer to in the course of the business and make necessary amendments to it when necessary. A business model exists so that it can be determined whether the ongoing business is making any sense, in other words, whether it is profitable. It answers the following interdependent core strategy questions: what is the target market and how are the members reached and related to? What is the margin of a business’ entire offering and what is outside the margin? What is the value promise that leads the customers to choose a company over another? What key competencies and partnerships prevents other competitors from copying another company’s promise? And finally, what essential factors are there to make sure that a business is profitable while delivering on their promise? Like mentioned earlier before, a business works like a system where many different factors or components work in unison for the benefit of the entire business. A business model focusses on how all the elements of a company are interwoven together to make a working whole. All stakeholders and all employees need to understand fully the core logic of a company and how it stands out from other firms. It is the purpose of a business model to show and remind them of this. For a business venture to be successful, the business model being used must be very innovative so as to keep the company above its competitors (Garrido, 2008). A company without an innovative model will find it very difficult to remain profitable in the ever competitive market and will most likely get bankrupt. Companies and firms adopt different business models depending on the products and services they are dealing in. The model that generates most profits is the one that is adopted. Business model differentiation has remained to be the only way that companies can be able to protect and maintain their profit margins in the ever competitive market. Through this, a company is able to have a core competency that will serve as its competitive advantage over its rivals. A core competency is difficult to imitate and it greatly contributes to the customer’s perceived benefit (Freedberg, 1997). A company like Honda has a core competency in the manufacturing of engines and power trains and that is why it has made a name for itself and remain relevant and dominant in the market all along. As a result of all this, the only way remaining for companies to protect their margins is through business model differentiation (Carlori, 1988). Businesses may operate in similar industries but with entirely different business models, however, with the passage of time the business models that are most successful dominate the industry. Some other companies succeed by copying the dominant industry's model, like the RyanAir business model, but this is a very dangerous move as they may miss out on the core competency and finally face bankruptcy. RyanAir innovated the general business model for aviation by having their own airport and including within it their own shopping malls and hotels. They also offered car hire services and parking, thus attracting more customers and increasing their revenues other than those they got from their passengers. The key factor in maintaining profitability is to innovate your business models to suit the customer in the perfect way (Haslam, 2015). A relevant example is seen in the mobile phone sector. Mobile phone carriers prefer to sell their mobile phones sets at relatively low prices so that they can generate most of their revenues from the plans based on the services consumed like the minutes people spend on calls. Investors find such a model as very attractive because it creates a continuous flow of revenues plus it has the potential to offer more new services and features in the coming future which means the revenues will continue plummeting. Wal-Mart can also be used to explain another business model. Its business models works this way. It offers the lowest possible price for its product so that it can sell more of them and capitalize on this so as to maximize its profits. By doing so it maintains its profit margins. In contrast, another company like Apple opts to follow a business model of selling fewer but high-quality products and earning a higher profit on each product. Technological advances have also given rise in new business models and most of them have been pioneered by leading companies such as Apple, e-Bay and Google (Duening, 2014). Apple came up with iTunes, which is a software for easily downloading music online but only usable on their hardware, that is, iPhones, iPods and iPads. By adopting the iTunes model, the company was able to combine its hardware, software and service at once. Downloading music from iTunes was not very profitable, but it greatly prompted its customers into purchasing the expensive iPods, iPads and iPhones and making huge profits from that. The optimal design of a scalable business model is to ensure increased profitability in the long run with no linear relationship between cost and revenue (Zhao, 2008). For example, a company like Microsoft incurs high costs in software development for computers. Afterwards, it only makes copies of the high-margin software at very lows costs or even at no costs at all but continues to earn more revenue from the software. This also applies to other big companies like Facebook and Google. The founder of Facebook incurred considerable costs in developing it, but afterwards he didn't have to do anything but to continue selling his product to more and more customers at no cost at all. To know whether a business model is any good, one simply has to ask themselves whether it is making any sense, and by this it is whether it is profitable or not. If the profit numbers don’t add up then the model is not good (Magretta, 2002). Many businesses have suffered heavy losses and have even gone bankrupt because their business models did not make any sense at all. An example of failed business models can be explained by US automobile companies Ford, General Motors and Chrysler, in their competition against foreign manufacturers. To attract customers, they offered them deep discounts and interest-free financing making them sell their vehicles at a lower cost than it cost them to manufacture them. This move significantly reduced their profit margins. For them to dominate the industry again, the companies had to change their business models. A model should never be seen as fixed, rather it should always be viewed as a work in progress. If it doesn't produce the desired results, another one should be adopted (Magretta, 2002). Models that are successful do not remain that way for long; they should be changed with the passage of time because the external environment also changes. In order to evaluate the profitability of a company, one should always learn how it makes its money. A thought should then be given on how it sustains, maintains and multiplies its profitability (Keynes, 2001). That is what would make a sound business model. CALORI, R., & ARDISSON, J. M. (1988). Differentiation strategies in ‘stalemate industries’. Strategic Management Journal. 9, 255-269. DRUCKER, P. F. (1985). Innovation and entrepreneurship: Practice and principles. New York, Harper & Row. DUENING, T. N., HISRICH, R. A., & LECHTER, M. A. (2014). Technology entrepreneurship taking innovation to the marketplace. Burlington, Elsevier Science. http://public.eblib.com/choice/publicfullrecord.aspx?p=1766347. HASLAM, C. (2015). Business models. 2, 2. London [u.a. ], Routledge. HISRICH, R. D., & PETERS, M. P. (2002). Entrepreneurship. Boston, McGraw-Hill/Irwin. KANUNGO, R. N. (1998). Entrepreneurship and innovation: models for development. New Delhi, Sage Publications. MAGRETTA, J., & STONE, N. D. (2002). What management is: how it works and why it's everyone's business. New York, Free Press. MEDINA GARRIDO, J. A., MARTINEZ-FIERRO, S., & RUIZ NAVARRO, J. (2008). Cases on information technology entrepreneurship. Hershey, IGI Pub. http://site.ebrary.com/id/10189415. OSTERWALDER, A., PIGNEUR, Y., & CLARK, T. (2010). Business model generation: a handbook for visionaries, game changers, and challengers. OWENS, T., & FERNANDEZ, O. (2014). The Lean Enterprise Applying Scalable, Repeatable, and Measurable Innovation in the World's Largest Organizations. Hoboken, John Wiley & Sons. http://www.books24x7.com/marc.asp?bookid=63767. PLANTES, M. K., & FINFROCK, R. D. (2009). Beyond Price: Differentiate your company in ways that matter. Austin, TX, Greenleaf Book Group Press. (2001). International journal of entrepreneurship and innovation management. Milton Keynes [England], Inderscience Enterprises Ltd. http://www.inderscience.com/browse/index.php?journalID=7. VERBEKE, A., LEHMANN, A. T. T., & VAN TULDER, R. (2011). Entrepreneurship in the Global Firm. Bradford, Emerald Group Pub. http://public.eblib.com/choice/publicfullrecord.aspx?p=823642. ZHAO, F. (2008). Information technology entrepreneurship and innovation. Hershey PA, Information Science Reference.